This (yet to be fully released) program is perhaps David Tian's magnum opus. This product represents the culmination of many years of research and coaching that has lead David Tian and The Aura Dating Academy to produce an immaculately designed dating/ confidence/ attraction system for men. A rare gem in an often overcrowded market, this product represents a high standard for dating products everywhere. David Tian (formerly known as The Asian Rake) was born in Taiwan to a conservative Christian Taiwanese family and spent his early developmental years growing up in Kansas City, Missouri and then later Toronto, Canada. In his late 20’s, after obtaining a PHD in Asain Cultures from The University of Michigan and following a divorce from his first wife he left Canada for China to further his studies. He later again moved to Singapore to take up a position as a professor in the Department of Philosophy at the National University of Singapore. He has held numerous academic fellowships, including from Princeton, Harvard, Tsinghua University in Beijing, Peking University, The Social Sciences and Humanities Research Council of Canada, the University of Toronto and McGill University. In August 2011 he resigned from his professorship to form Aura Dating Academy in Singapore and pursue his calling as a Dating Coach. David quickly rose to relative national fame in Singapore, known as Doctor Date and dubbed the ‘Hitch’ of Singapore. He has appeared numerous times on both national and international news and similar broadcasts and is well respected as a dating coach (as apposed to a Pick Up Artist). David prides himself of an academic and intellectual approach to attraction and seduction and boasts of in-depth research into neuroscience, psychology, biology, sociology, literature, philosophy, history, and the behavioural sciences in forming his dating programs. His other products include The Girlfriend Activation System and The Desire System which we have reviewed on our site. 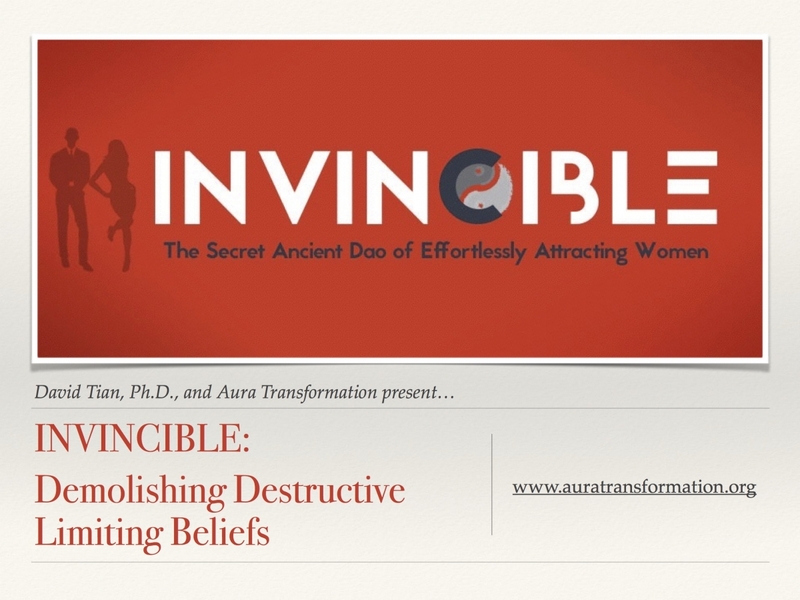 Invincible by David Tian, The Secret Ancient Dao of Attracting Women, is an upcoming program by David Tian of The Aura Dating Academy. It has been beta released, and is looking forward to a full release min 2016. The program represent the first major release within the men’s dating niche in over a year and is set to be the highest production quality program to date. The program is focused on teaching men to become more attractive through proven psychological engagements and personal changes. As with nearly all modern dating programs, Invincible focuses less on gimmicks and tricks and more on creating genuine, base level change towards a more masculine self identity and lifestyle. The authors academic background in behaviour research afford the program a strong, researched based background and helps to focus the program on what is actually proven effective and back by research. The program was shot over a 4 day seminar in 2015 in Singapore using state of the art recording equipment. While the bulk of the program consists of lectures by David Tian and guests, some of the program also includes questions and answers by attendees, which adds for a nice touch and helps clarify points that any listener would raise. The Aura Dating Company has chosen not to leave this program open to signups at all times, but rather restrict sign-ups to registration windows. The best way to get the opportunity to register is to head over to the site and get on the mailing list, you’ll then get an email as soon as sign-ups are open again. The cost of the program is between $497 and $597. This is far, far higher than the average dating product but in many ways it is justified. The program includes over 32 hours of footage, and allows access to an exclusive members only forum. The forum, unlike many others, is actually quite active and gives you access to David Tian himself and other experts. I rated Effectiveness as 4. Comparing it to other inner game products, I’ve personally felt my inner game improve better from a 30 minutes of listening to a non-game oriented audio than listening to this and doing the Invincible exercises. The “non-game oriented” audio that works well for me is Supreme Self-Confidence by Paul McKenna, and another one that works well is Self-Image by Paul McKenna. I rated Ease of Implementation as a 2, simply because some of the crucial exercises were so unclear to me that I have no idea how to do them, even after watching/listening to them several times. More on this in my long review below. I rated this as a 1, because frankly this is mostly taken from other sources, both game oriented sources and non-game oriented sources. To be fair, I usually don’t care about how innovative a product is AS LONG AS it is the clearest presentation of the best available material. Additionally, many paragraphs are plagiarized VERBATIM. Even an entire page from a book (uncredited) plagiarized word-for-word. David Tian does not get Innovativeness points for that (more on that below). Rated this as 6 because this is a well-produced program in many ways–it is better than many, and worse than some. The packing is a moot issue. $500 is a trivial investment if two things are true: 1., the program is solid, and 2., if this is the only place you can get the information. I rated this a 4 because the same (and in many cases better) advice is available to you in cheaper or free sources and often presented in a clearer, more structured manner. He says that thousands of years ago, the life span back then was 20 or 25 years. This is incorrect. The life EXPECTANCY was 25 years, not the life SPAN. The life span was much longer. Healthy people back then lived to 80 years old about as frequently as healthy people do now. You weren’t an old person at 25 years. Life expectancy is the average age at death of the entire population—including the 1/3rd that died at childbirth. This pulls down the average—the life span—down to 25 years old. Once you pass age 1, and then again pass age 5, your life expectancy dramatically increases (yes, an individual’s life expectancy DEPENDS on their current age). Module 2 is a PDF. It looks almost like a powerpoint that could only makes sense to someone who listens to the speaker explaining each bullet point. In other words, it looks as if these are a few words to joggle David Tian’s memory so he can remember what he wanted to talk about. I would prefer a PDF that is self-sufficient, that actually makes sense in its own right. Notice the third bullet point. It doesn’t make sense. And no, there is no talk that goes along with this PDF. This is Module 3. This I found unhelpful for the same reason I have found other self-hypnosis tracks unhelpful. What positive belief??? The belief that I am awake, alert, and clear? The first two times I listened to this (I had to rewind several times), I thought I missed the part about David Tian saying, “Come up with a positive belief now. I’ll give you a minute to think of one.” Or, “For the next 30 minutes, I want you to focus on the positive belief XYZ.” Nope. He just started waxing on and off about how “this positive belief” has changed your life, and more about “the positive belief.” I still have no idea what positive belief he’s referring to. Most hypnosis programs, from Ross Jeffries to Tony Robbins to David DeAngelo to Hypnotica, make the mistake of expecting the listener to quickly “think of a time when you felt confident.” Then they rush right into the next sentence, ignoring the fact that it may take me 15 seconds to think of such a time. Here, David Tian spends no time at all asking us to think of “a positive belief that could dramatically improve your life.” I guess I’m left to assume he’s talking about the belief, “I am awake, alert, and clear.” This sounds nice, but unfortunately, I’m not clear on how this belief could change everything for the better. Is there more to that? I just googled the little affirmation to see if I could find some clarity (clarity that David Tian did not provide). I can see that it came from the book Innovations in NLP for Challenging Times Volume 1o. Referred to as the Visioneering Exercise. and MADE THEM DIRECTLY APPLICABLE TO DATING. He has simply taken the guided meditations and repeated them verbatim. He didn’t adapt them or make them applicable to dating at all. Here he goes into The Art of Seduction—one of the worst books written on seduction. When I say it’s one of the worst books on seduction, what I should really say is that, like The Game (by Neil Strauss), it is well-written. Also like The Game, it has a lot of fluff and fiction, and a few neat-sounding techniques that sound very clever to a thirsty guy (but are not super-effective in the real world except to fill a lot of time with a girl with grade school games, riddles, and tricks—all of which impress a GUY more than a girl—if you don’t know what to say or how to escalate). In a way The Art of Seduction is even worse than The Game, because it catalogs all the “great lovers” throughout history that just so happened to own castles and be super-wealthy. It’s like learning how to seduce a super-model from Elon Musk—who also happens to be a billionaire. It’s a lot of esoteric woo-woo that sounds smart. There are some good points, no doubt, but most of them are things you realize on your own when you were 15 (for example, if you appear very masculine, then work on deepening your personality by brushing up on your bookish side—sort of like the appeal of Beast in X-men). In other words, round out your one-dimensional personality. At first glance, this strategy seems to be paradoxical if you are also trying to display a congruent identity (like “rock star” or “celebrity” or “successful business man” or “cool skater dude”). On the other, it’s a good idea. But that’s not why those “master seducers” were successful at bedding women. It was because A., he made it a goal to bed women, and B., he owned a castle. There are some good tactics, but honestly most of them are not innovative (not David Tian’s). His “just kidding” technique is innovative, but terrible (he calls it “Implant your ideas in her mind”). Say something suggestive and then say “just kidding.” That is lame, approval-seeking, and weak. You should probably NEVER say “just kidding.” Especially after saying something suggestive. This is probably the WORST TECHNIQUE I’ve heard from David Tian. There are several ways to say something suggestive and “implant” your ideas in her mind…without saying “just kidding” after you say it. For example, Ross Jeffries “Quotes” technique would be better. Or Sinn or Vin Dicarlo has ideas about this which are more subtle and effective (and are not something a pubescent middle school boy would do). His talk on honesty 21 Convention is free to watch on Youtube, and is included in this program. I was not impressed by it. Almost every demonstration of “honesty” he used just sounded lame and needy, and “to be honest” (in that needy way) is not effective and does not impress a woman. Men have tried it before. I’m not saying you should lie to her. And there are times when being brutally honest will impress a girl (for example, I’ve told a girl that if she fell in love with me and we ended up being an item, I would almost certainly cheat on her, and that I had cheated on almost all my previous girlfriends– no guy had ever talked to her this way, and she still remembers it as one of my greatest traits). I am saying that none of his examples were good ones. One of the things I like about David Tian is that he makes it clear that your looks DO MATTER (he doesn’t say this in the advertising, but in the actual Invincible program). More gurus are being transparent about this.